Our official CLOSED DAYS are MONDAY and TUESDAY, however as we live on the premises, its worth ringing 01277821031, or ring the front door bell or the bell on the side gate. IF WER’E IN WE’LL LET YOU IN !!!!! We seldom turn thirsty customers away, and will open the Antiques Shop on request , unless we have a pressing prior engagement. 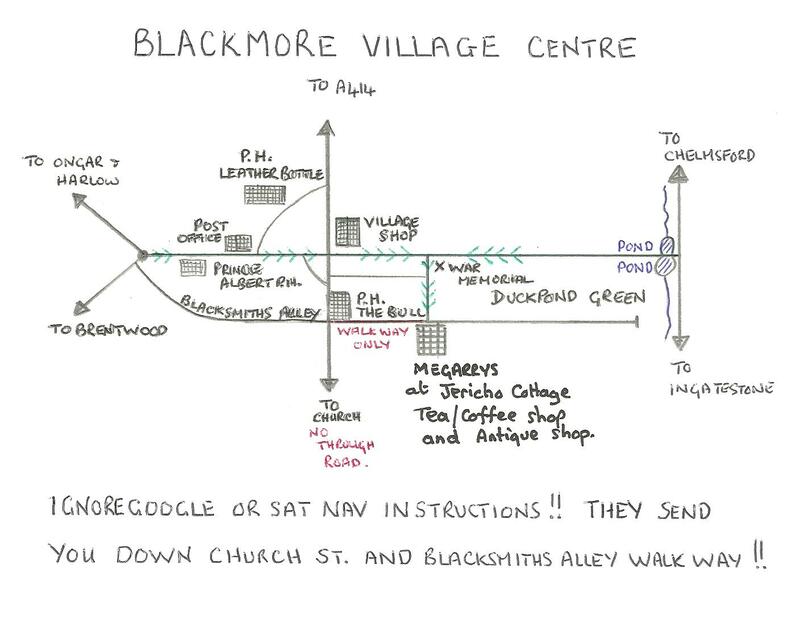 …….N.B.WE ARE NOT IN THE VILLAGE CENTRE but are only 50 yards away!! MEGARRYS TEASHOP AND ANTIQUE SHOP ARE LOCATED IN JERICHO COTTAGE,IN BLACKSMITHS ALLEY, AT THE REAR OF THE DUCKPOND GREEN,BEHIND THE BULL PUBLIC HOUSE GARDEN . COMING FROM CHELMSFORD, OR INGATESTONE…………,TURN ONTO THE GREEN VIA THE BRIDGE OVER THE POND, AND TURN LEFT AT THE WAR MEMORIAL . COMING THROUGH THE VILLAGE FROM BRENTWOOD OR ONGAR………….., CROSS THE CROSS ROADS BY THE VILLAGE SHOP, AND WE ARE AT THE END OF THE NEXT TURNING ON THE RIGHT BY THE WAR MEMORIAL.